10 Quick Tips - How to Photograph Fireworks! Summer is here and with USA’s Independence Day just about upon us, I wanted to share with you some quick tips on how to photograph fireworks. By the end of this tutorial you will have the preparation needed to bring your camera along with you for the fireworks celebration and actually be able to capture with confidence! 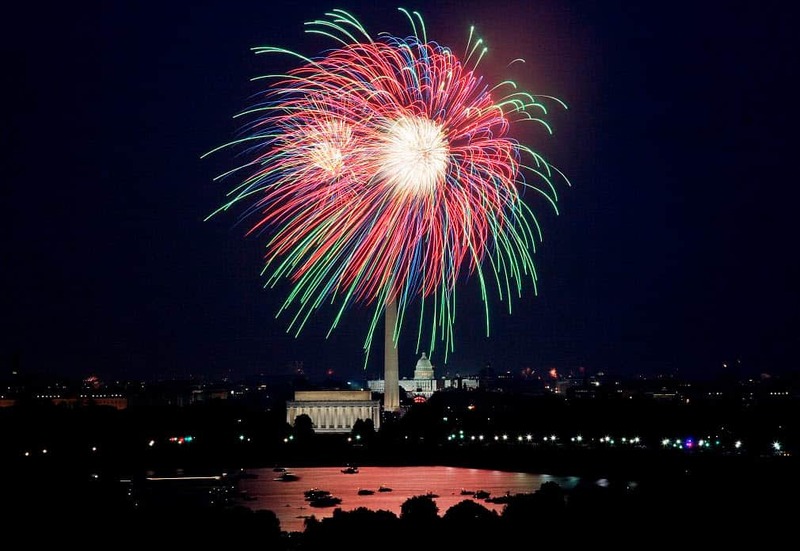 Pick Location Wisely – Take the time to scout out a great location to view the fireworks from. A couple things to keep in mind would be to find somewhere that you will have an unobstructed view of the fireworks. In addition, if you can find something else (cityscape or water) to compose in the foreground of your shots it will make for a more interesting composition. Quick tip – do your best to pick a location that isn’t downwind from the fireworks, otherwise after the first couple fireworks your photos will be clouded by the smokey haze. Turn the Flash Off – The flash will do absolutely nothing to help your shots of the fireworks and will actually ruin the photos by illuminating objects in the immediate foreground of the photo. So just remember, first things first, turn it off! Full Manual Mode – To get the best possible photos of the fireworks you definitely will want to have your camera on full manual mode so you can control all three elements of exposure – ISO, aperture and shutter-speed. Tripods are a Must – To effectively capture fireworks, you will have to use a very long shutter speed and without a tripod you simply will get one blurry photo after another so bring a sturdy tripod along! Shutter Release Remote – For the same reasons it’s crucial to bring a tripod (to prevent unwanted motion blur) you ideally should be using a shutter release remote which will let you open the shutter without having to physically touch the camera – which can cause blur. Keep ISO Low – Since you are now ready to take some long exposure photos, make sure to use as low of ISO as possible to ensure your photos are as clean and crisp as possible. Manual Focus – Focusing at night is always a challenge and with fireworks it is no different. What I find works best is to leave your camera on auto-focus to focus on something (like a building or tree) in the far distance, then once you’ve acquired focus, switch the focus on the lens to manual so it doesn’t move at all. Quick tip – take some tape to tape the focus ring once you’ve set your focus to help ensure you don’t accidentally move the focus ring without knowing! Camera settings – It is impossible to tell you what your “exact” settings should be but start out with this and then adjust as needed. ISO – 100, f/11, 2 seconds shutter speed. If the fireworks are too bright, pick a higher f-stop number and if too dark, vice-versa (like f/8). If you want to include multiple firework bursts you should increase the length of your shutter speed or you can even use “bulb” mode on your camera in which you control the length of the shutter manually. If using “bulb” mode, open the shutter at the start of the firework trail and hold open until the burst, or longer to capture more! White Balance – I’d shoot in RAW to ensure you can easily adjust the white balance later to give you either a warmer toned or cooler toned photo. Have Fun & Experiment! – Don’t be afraid to experiment by making larger adjustments to the shutter speed or aperture, it is the best way to learn and you might just snap your best photo yet! Got any tips to add? I’d love to hear from ya so let me know! 2 Responses to 10 Quick Tips – How to Photograph Fireworks! How Groupon Skyrocketed My Photography Business! The Ultimate Complete Wedding Photography Gear Guide!